A helicopter drops water on the Eagle fire in southern California, July 27, 2011. Photo by Lone Ranger. 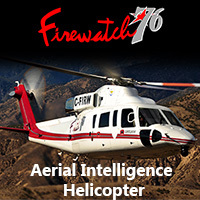 The U.S. Forest Service has reversed course and decided to contract for one firefighting helicopter that can fly at night, becoming mission-capable in 2013. The helicopter, which will be based in southern California, will support wildfire suppression on Forest Service-protected lands within and adjacent to the Angeles, Cleveland, and San Bernardino National Forests, and the southern half of the Los Padres National Forest. 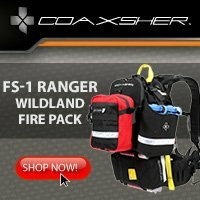 It has been years since the USFS had that capability. In 1977 a USFS helicopter and a Los Angeles county helicopter operating at night collided, killing one pilot and injuring another. Sometime after that the USFS abandoned night flying. The USFS was criticized for attacking the 2009 Station fire near Los Angeles on the first night and the morning of the second day with strategy and tactics that were less than aggressive. The fire was three to four acres at 7 a.m. on the second day, but no air tankers or helicopters were used the first night or until later in the morning on the second day. The fire took off at mid-morning on day two and later burned 160,000 acres and killed two firefighters. Night-flying helicopters operated by Los Angeles County were not used the first night on the fire. After the Station fire several politicians became involved in the controversy and pressured the USFS to restore the capability to use helicopters at night to drop water. The agency said they have been studying the concept, again, and announced today that they would tip-toe back into night flying, with a single helicopter in 2013. The USFS is the lead federal agency managing the fixed-wing air tanker program, which has withered away from the 44 exclusive use large air tankers we had in 2002 to the 9 we have today. 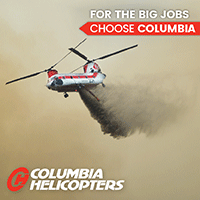 Air tankers and helicopters do not put out fires, but under the right conditions they can slow the fire enough to allow ground-based firefighters the opportunity to suppress it. In our opinion, the U.S. Forest Service’s Fire and Aviation Management program is not aggressively attacking emerging fires, adapting to changing conditions, or effectively managing the aerial firefighting program. Some of this can be attributed to declining firefighting budgets that are requested by the administration, approved or modified by Congress, and signed by the President. The 1977 mid-air collision referenced occurred on the Middle Fire, ANF. Post accident the FS stood down night flying and re-evaluated of the safety and viability of night operations. Organizational and safety changes were made and the program resumed the following season, 1978. Night flying came to an end a couple of years later as a result of the costs associated with the contract – twin engine a/c, pilot quals, # of of pilots, # of personnel to staff a 24 hr operational period – not as a direct result of the accident. Did they say what type of ship it will be? I looked at the USFS budget. USFS has a summary of the last ten years of funding in their 2013 budget. I converted the funding info for their discretionary accounts into constant 2012 dollars to get a relative comparison of actual funding levels. The USFS has been pretty much level funded since 2003 except for 2010 which was higher than average. That would suggest that either the USFS cannot manage an air tanker program or that they were directed to reorient discretionary funding to other programs.